Here's just a small sampling of the photojournalism projects i've covered. 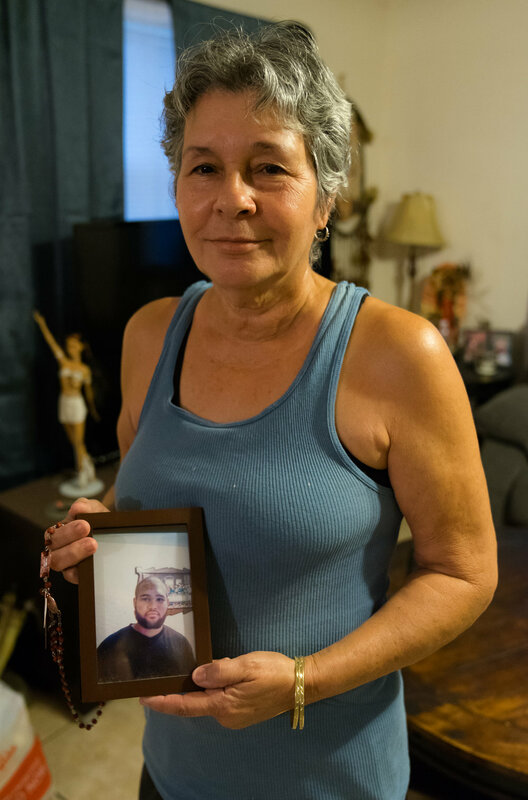 Tina Rivera holds a photo of her grandson, Damian Rivera, who is buried at Lake Trafford Memorial Gardens. Damian's gravesite is just one of many sites at the cemetery that are underwater due to poor drainage and lack of maintenance. Countless local residents braved the heat on Saturday for the Lipman 6th Annual Backpack Giveaway / Back to School Event at Immokalee High School. Omar De Leon, Senior Planner with Collier Area Transit discusses proposed changes to CAT bus routes in Immokalee. State Road 82 claims yet another life as a driver crosses the center line and hits another vehicle. FDOT is not expected to begin a road-widening project on SR 82 in Collier County until 2019, 10 years after the play began. Jennyfer Gerrero Torres becomes the first Immokalee High School graduate to attend Harvard University without having first earned an undergraduate degree. Jennyfer completed her associates degree at FGCU while finishing her high school diploma and doing so with a weighed 5.5 GPA. Jennyfer plans on studying Human Developmental and Regenerative Biology before starting Harvard Med where she plans on becoming a pediatric surgeon. Homeowner Kyle Dunn thanks firefighters after saving his home. Kyle told firefighters that he just purchased the property within the last few months. The #30thAveFire burned thousands of acres of land and destroyed multiple homes. First responders were able to save thousands of others homes in the area. Firefighters, administrators, and members of the public came together to honor Terry Heath who previously served as a firefighter and Fire Commissioner with the Immokalee Fire Control District. Fellow firefighters worked tirelessly on creating a shadow box at Station 31 where Terry spent most of his shifts. Immokalee Fire Chief Paul Anderson receives well-wishes from the Fire Commissioners he served under. Chief Anderson faced mounting criticism for utilizing funds for vacation buyout in violation of his contract, failing to achieve goals set forth by the District, threatening a local business owner with a lawsuit over a personal matter, carrying a firearm on duty, and failing to report a crash that his vehicle was involved in. After a career spanning close to 40 years, Fire Marshall Leo Rodgers is ready to retire from the Immokalee Fire Control District. Leo holds a photo taken many years ago when a much younger Leo Rodgers attended the fire academy. Leo has served the area as both a firefighter, fire marshall, and corrections officer. The Big Ring Circus visits Immokalee and brings with it amazing animal acts, stunts, and clown who can balance just about anything on his chin. The annual event kicked off at Robert's Ranch in Immokalee. Driver-Engineer Derek Neuman and his wife Lauren find out that their upcoming arrival will be a baby boy. Firefighters dyed the water blue in Heavy Rescue 31 for the special announcement. Through a collaborative effort, First-Book delivers free books in Immokalee. Thanksgiving in the Park celebrates 35 years in Immokalee. Roughly 100 volunteers helped to serve meals to approximately 2,000 needy individuals in Immokalee during this annual event. A local student shows Barbara Mainster how technology is improving classroom learning at Pinecrest Elementary School. For the third year in a row, several organizations came together to deliver Thanksgiving meals to local families in need. Fire Commissioners snub public comment while Chief Paul Anderson receives raise. Additionally, Chairwoman Anne Goodnight sends email to other Fire Commissioners directing the Chief to choose one auditor to enter into a contract with. Commissioner Goodnight's email was sent outside of the public eye. Collier Area Transit (CAT) authorities held a public meeting at CareerSource in Immokalee to gather public input about proposed changes to bus routes and stops in town.